Antiques and fine art can substantially increase the value of your estate, so it’s important to know what they’re worth. Consider the client who thought she had $12,000 worth of art, when in fact she had more than $150,000. Deciding what to keep, what to give away, what to sell – and how – is difficult and time-consuming for most people. when is it a good time - seasonal or market state considerations and are you under deadline pressure that might prevent getting the best prices which might lead to regrets down the road? John’s services make the job easier and hasten the process. He also has the time to spend with elderly clients; time their own children can rarely afford due to career and other family commitments. He listens and responds to the issues and the memories that often make it difficult for clients to dispense with possessions. John spends the time, does the research then offers informed, sensitive advice. This is work he truly enjoys. The executors of a large estate recently hired him to advise them on how best to dispense with the home’s contents, which included everything from household beds and furniture to antique dishes and glassware. He established market values, identified sales options and made recommendations. This enabled his clients to make informed choices – rather than best guesses. An appraisal is an informed opinion of value based on knowledge and experience. 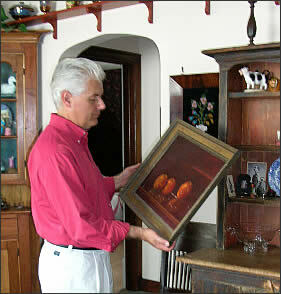 John has been an antiques and fine art appraiser for over 30 years. His syndicated weekly newspaper column, This Old Thing! (formerly So, What’s it Worth? ), which appears in the Saturday Toronto Star and other Canadian newspapers, is now read by over two million Canadians every week. Please note John does NOT buy what he appraises so there is no potential for conflict of interest. If you need only a single item or a few items appraised, you might want to consider his online appraisal service at www.johnsewellappraisals.com. “We hired John Sewell to appraise a large collection of art and antiques donated to the South Essex Arts Association. We found him to be professional, personable and extremely knowledgeable. His fee was also very reasonable. I highly recommend his services.” - Ralph Butler, Director/Treasurer, South Essex Arts Association, Leamington, Ont.